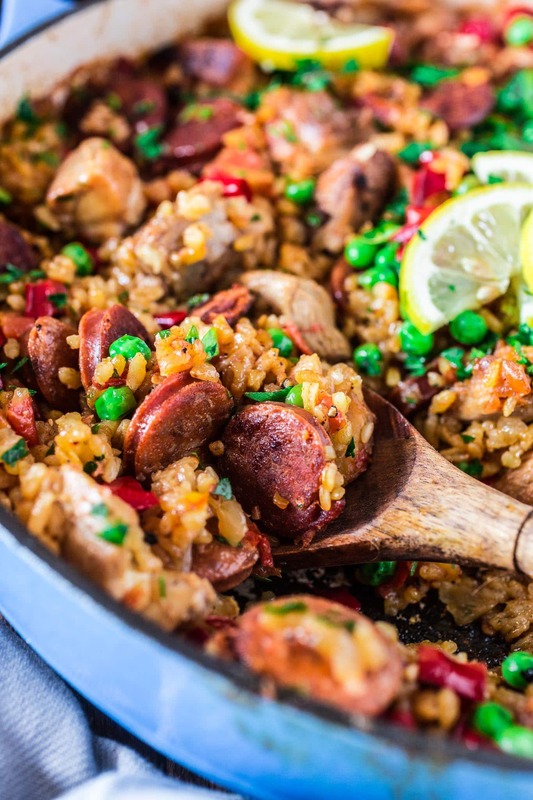 A Chicken and Chorizo Paella might sound like a very ambitious project, but once you realize how easy and quick it is, you will be making it over and over again. Pair it with a bottle of Garnacha Wine and you’re all set for success! I hope you got to celebrate it by drinking good wine and eating delicious food. If you didn’t, don’t worry, you can still catch up! After all, every day should be Garnacha Day. Tim and I had some friends over, who didn’t have a clue that it was a wine holiday, but enjoyed being served Chicken and Chorizo Paella and tasting new wines nevertheless. It was the perfect Spanish inspired evening and my guests already suggested we make it an annual thing! Considering it took me less than 1 hour to get this dish done and that it was all done in one pot, I’m down for an yearly Garnacha Day celebration. Nothing like pleasing a crowd without having to work all day in the kitchen! I know paella is a sensitive subject that stirs all kinds of emotions in the big internet world. Even my guests and I ended up having a (friendly!) discussion on the matter. After all, what is an authentic paella? Does it have to have seafood to be considered paella? Is any rice dish mixed with some protein, veggies and spices considered a paella? Depending on the region in Spain, the meats and vegetables added to paella vary. Some of the popular choices are rabbit, chicken, snails, chorizo and, of course, seafood. The only three basic ingredients that are common to all paellas? Water, olive oil and – obviously! – rice. So, going back to the original discussion, is a chicken paella considered a paella, even without seafood? Yes, it is! 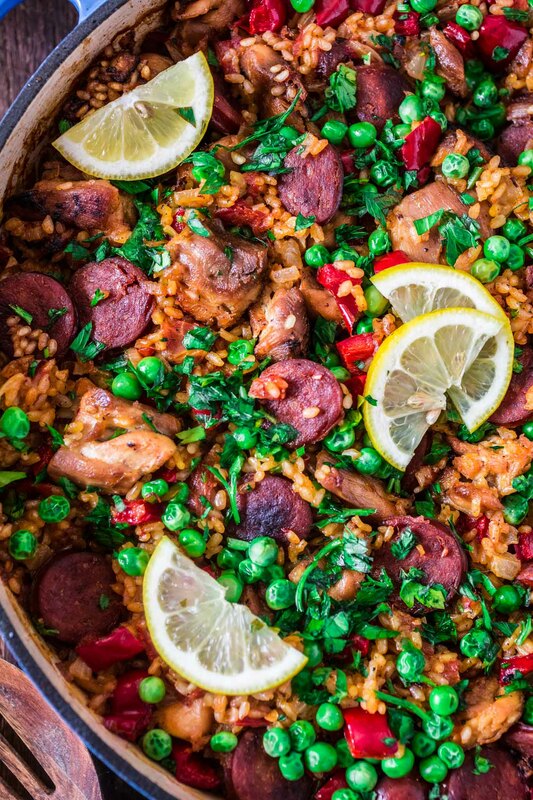 That being said, if you’re a seafood lover, you could always add some shrimp to this chicken and chorizo paella! That way you don’t run the risk of a pseudo paella snob raining on your parade! ??? Now, since I am already knee deep into food nerdiness, I figured we would also talk a bit about Garnacha Wine, which also comes from eastern Spain. This versatile wine eventually spread to other European countries and finally, in the 18th and 19th centuries, to non-European regions like Australia, North Africa and California. However, it wasn’t until recently that it stepped into the spotlight. Today, Garnacha is very trendy – especially among millennials – so if you haven’t tried it yet, I suggest you get on it soon! 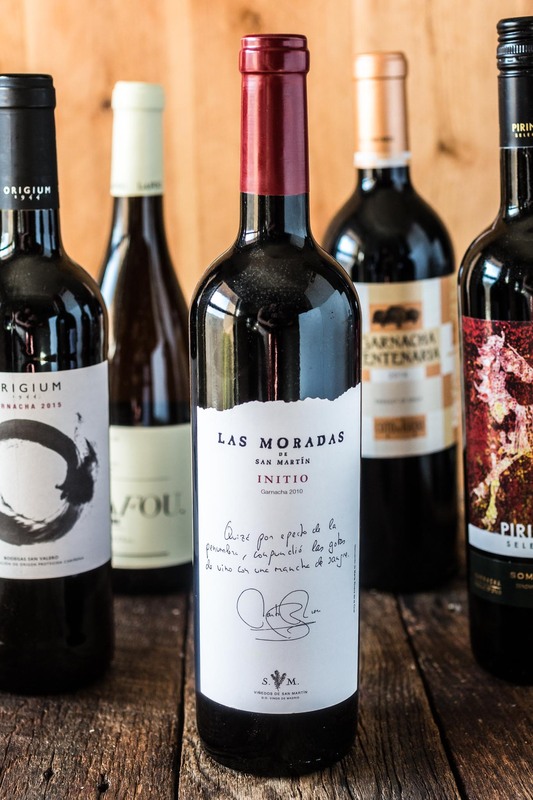 Garnacha is the only mainstream grape with red and white varieties. The wine itself can be red, white, and rosé, so you can pair a whole meal with different Garnacha wines. Its versatility makes it ideal for any season and easily paired with any cuisine. Oh, and its excellent value, ranging from $10 to $20 a bottle, makes it accessible for any budget. 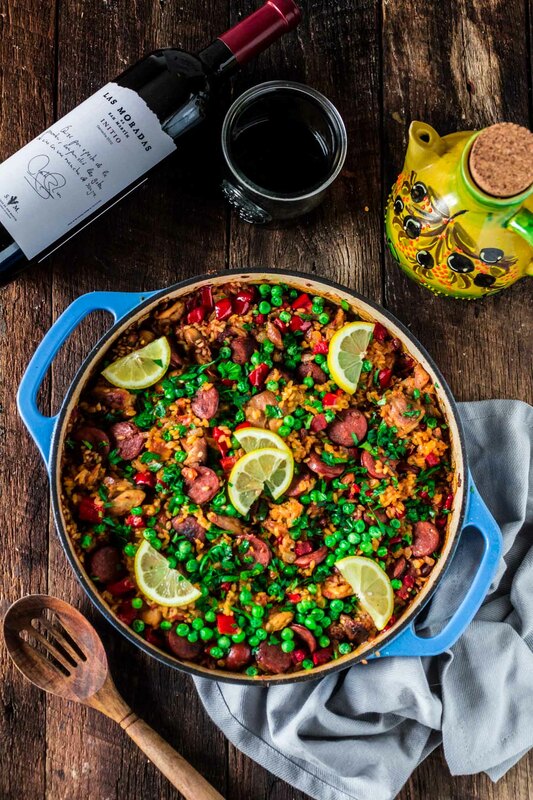 Since it is so affordable, I highly recommend you stock up on Garnacha wine, because they go VERY quickly, especially when paired with delicious food like a hearty Chicken and Chorizo Paella. Now, you will notice that I do not own a paella pan. I used a large casserole pan and it worked perfectly! Maybe one day I will invest in one, just so I can feel like a true paella maestro, although that is usually a man’s job. Oh yeah, making paella was traditionally the domain of men, who cooked the communal dish, usually on Sundays, while the women were at church. Also, they say that “to be truly worthy of the name”, the dish must always be prepared and eaten at open air, “preferably in the shade of an old vine or fig tree”, and always during the day. And although that sounds lovely, I’m too much of a rebel – not to mention a woman who lives in an apartment – to follow the rules. The only rule I recommend you follow is the type of rice you should use. Paella is traditionally made with Valencian Rice, but any short or medium-grain variety will do! You want a rice that absorbs liquid easily and won’t dry out, so stay aways from the long-grain variety. Also, stirring is absolutely forbidden, hence why I am suggesting you transfer the pan to the preheated oven after you add the rice. We are aiming for a tender, but not risotto-style creamy result. The brown, crispy layer that forms on the bottom of a well-cooked paella – known as socarrat – is a highly prized delicacy. 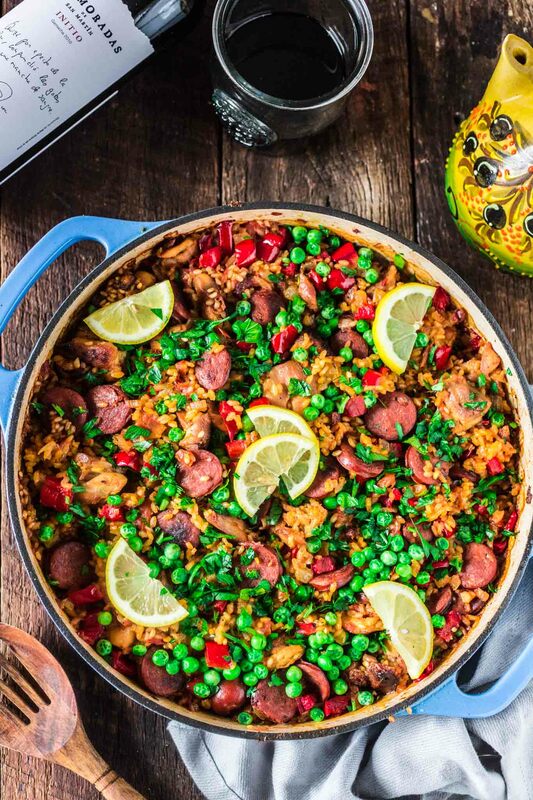 So now that you know how to cook an amazing Chicken and Chorizo Paella, all that is left to do is open a bottle of Garnacha! If you have too much drippings at this point, pour off some, leaving about 2 tablespoons in the pan. If you don't have enough, add 2 tablespoons olive oil. Reduce heat to medium and add the chopped onion, sautéing until translucent, about 2 minutes. Add the garlic and stir for 30 seconds or until fragrant. Then, add the tomatoes, the red pepper and the smoked paprika. Cook for a couple of minutes, until the veggies are softened. Delicioso!! Que bueno el sabor y tambien la presentation de la plate con limones! Salud! Excellent recipe. I have made it a few times and always get rave reviews. My only change is that I add cilantro instead of parsley. Thank you! I was wondering why you stir your paella in the end? I thought you wanted to get the crispy rice later at the bottom?